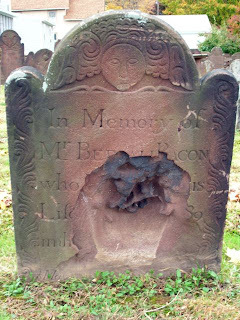 "The Most Hideous Stone Ever Quarried"
As I noted in my previous blog posting about Stories in Stone, when my wife and I moved to Boston in 1996 from Utah, I went into rock withdrawal. So, like a good geologist should do, I began to seek out nearby rocks in the local buildings. One of my favorites was Harvard Hall on the Harvard campus. Built in 1766, Harvard Hall is a stately Georgian structure that sits on a base of brownstone. I distinctly remember walking up to the building to look at the stone, which had succumbed to weathering. Making sure that no one was looking, I stroked the crumbling rock. Sand grains accumulated in my hand. They immediately transported me back to my beloved Utah. Another use of brownstone, which shows how it can erode over time. Although I had looked at brownstones for months it wasn’t until the sand grains of Harvard Hall nestled in my hand that I made the connection: what I had known as red rock in Utah, easterners called brownstone. Both are sandstone colored by iron, which in an oxygen-rich environment rusts and coats individual sand grains like the skin of an apple. 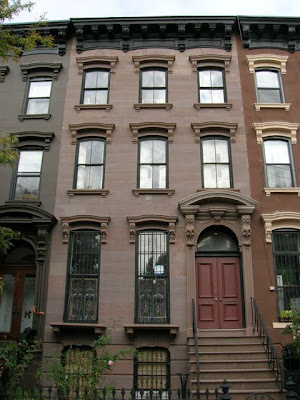 Used extensively in rowhouses in Boston, New York, and Philadelphia, brownstone made these buildings elegant, yet simple, and with an air of permanence. They exemplify the density of urban life. Famous brownstone denizens have included Sesame Street’s Bert and Ernie, and Holly Golightly, from Breakfast at Tiffany’s, as well as real people such as Edith Wharton and Edger Allen Poe. By the late 1890s, the clamor for brownstone was over, driven primarily by a fatal problem; water and salt could penetrate its layers. When water freezes it expands nine percent. Salt has a similar property but instead of expanding it grows. Both processes can wreak havoc on a building block. 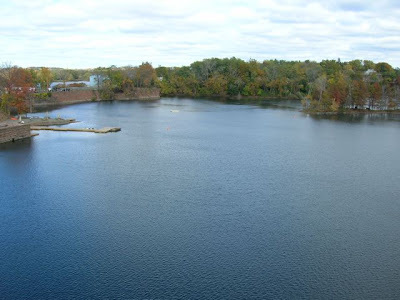 The former Portland, CT quarries, now flooded. Meehan’s first contract was for a restoration project at Gallaudet University in Washington, D.C. Institutions have continued to order his stone, which he has sent to Brown University, Yale, and Pratt Institute. In recent years, after acquiring his own milling saw, he has been providing detail pieces, such as steps and lintels, for more and more high end homes, including one in Brooklyn, which I visited. Meehan cut the new blocks to emphasize the bedding planes of the Portland rock. Each block is different with a variation in grain size, color, and bed thickness. They have a warmth and substantial nature to them, unlike the adjacent restorations, which obtain their look with stucco. As I sit here in Hastings-on-Hudson, New York, I look out my window across the Hudson to the Palisades. I have often heard that the brownstones used the brown stone of the Palisades, and the Palisades were certainly quarried through the early 20th century. But the Palisades are basalt extrusions, aren’t they? Help me here! Diggitt, Thanks for the note. I am not very familiar with the geology of that area but I do know that brownstone came from the rift valleys in New Jersey. For example, quarries in northern New Jersey, primarily along the Passaic River in Little Falls, Paterson, and Belleville, provided stone for many institutional buildings in Manhattan, including Trinity Church, one of the first buildings with brownstone in New York. A homeowner's nightmare. Rex Stout's Nero Wolfe, who lived in a brownstone in New York City, would, I suppose, have been forced to take more cases. They used to Quarry quite a lot of brownstone around Sanford,NC as well, same look same eventual problems. We're looking at the restoration of a beautiful brownstone iron furnace down here (Endor Iron Furnace). You might enjoy trying http://www.stonefoundation.org for a lively group of stonemasons and friends of stone.